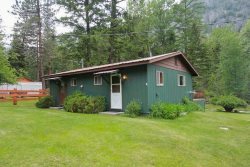 This little studio cabin is in a private location close to the lake and all of the Wallowa Lake activities. It has a private little lawn and its own picnic table and outdoor deck. This cozy Wallowa Lake studio cabin includes a kitchenette and bathroom with a shower. It also has a nice deck to relax on during the summer and a propane barbecue. Why stay in a hotel room when you can have your own cabin close to Wallowa Lake and the resort activities? This cabin is cute and the perfect size for people who are out hiking, fishing, or even perusing the shops in Joseph all day and just need a comfortable place to relax in at night. Cabin Size: 300 Sq. Ft.